Since 1992, the Plainfield community and schools have recognized one value each month, based on values selected by a committee of residents and school personnel. 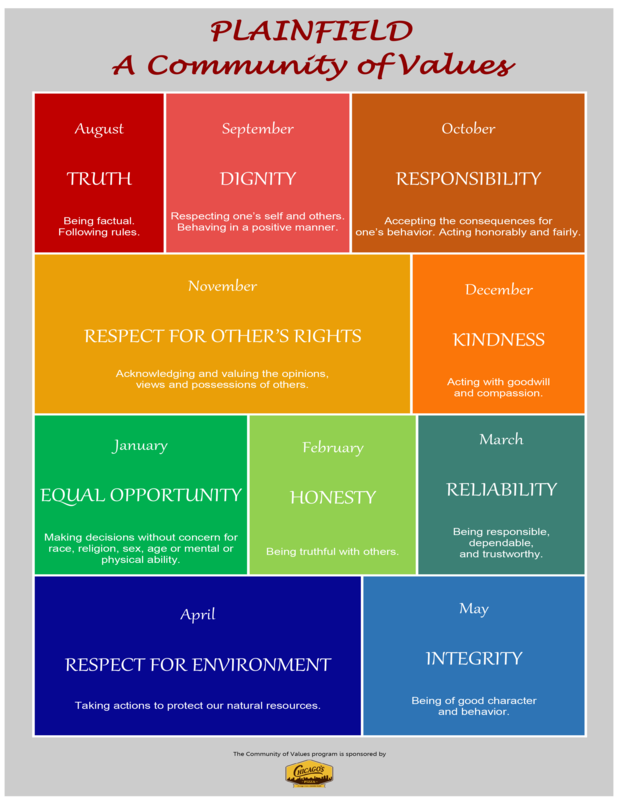 Over time, the 12 values were adjusted to fit the school calendar; each month during the academic year, students talk about and learn to model the skills and behaviors associated with that value. Principals from each school select one student, nominated by their teacher, who best exemplifies that month's value. Those students are then honored at the next School Board meeting, with adoring parents and grandparents usually in attendance. In addition to a commemorative plaque, students receive a gift certificate generously donated by Chicago's Pizza.